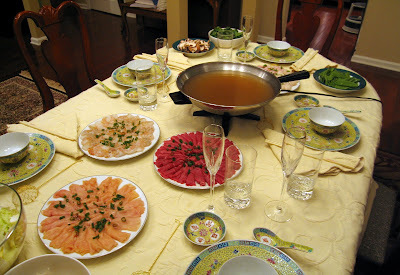 This past weekend my girlfriend Jenn and I went to my Mom's house and she cooked 'Mongolian' Hot Pot which is one of my favorite meals. All you're really doing is cooking a bunch of meats, seafood and veggies in chicken broth but it's a great meal that is perfect for large groups of people and a fun experience. The two keys items you need to make this happen are the 'hot pot' so that you can bring the broth to a boil (keep it covered to start), and a bunch of little baskets so that everyone can cook their food. The actual meats and veggies used can certainly vary. 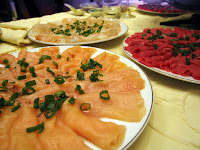 This time around we used thinly sliced chicken, beef, lamb, small scallops, shrimp & fish. Normally we use monk fish or even red snapper but this time my Mom went to the Asian market and they had fish that was simply called 'hot pot fish'... It tasted similar to monk fish but wasn't. We also kept rice noodles, snow peas, mushrooms, Napa cabbage (bok choy also works great), spinach and vegetable dumplings on hand as well as lots of extra broth to keep the level high enough to cover people's baskets. The other key item we make sure everyone has is dipping sauce. We had oyster sauce for the meats and a soy sauce based sauce that my Grandma makes really well. It's just soy sauce, rice vinegar, garlic, ginger, scallions, cilantro, a little sugar and sesame oil. Another good tip is to make sure each meat has a serving fork or spoon so that people don't end up with juice from the raw meats on their eating utensils and plates or bowls. Everyone just fills their baskets with whatever meats and seafood they want and lets the baskets rest on the edge of the hot pot. We usually just throw veggies and noodles in as needed and serve with bowls also so you can make soup as you go. You can also always just throw whatever is uneaten in at the end, let it cook and have soup as leftovers. Yum, that looks like a delicious and fun party idea!